So you want to enable Aero glass transparency effect on Windows 8 without any bug or glitch. 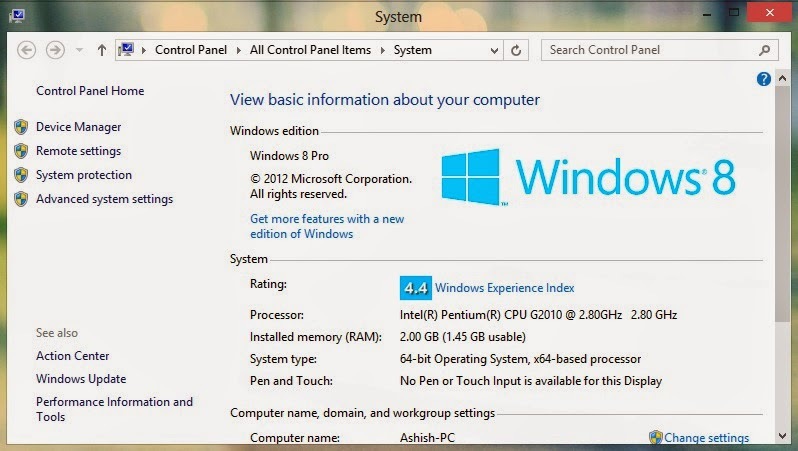 Just follow the steps and enable a stable transparency effect on your Win 8 PC. Microsoft has removed Aero Glass in Windows 8. It will be very disappointing to the users who like Aero Glass effect. But here is a trick to apply Aero Glass effect back into Windows 8. It is very easy to do it. Microsoft has removed many codes that enables aero effect in Windows 8. This trick isn't so good but you will be able to enable Aero Glass transparency without any bugs in your system. This trick will allow you to enable full transparency and not translucent effect. So let's what's the trick that will allow you to do this. Just follow the following steps carefully. At first we will need to apply buggy transparency effect in Windows 8 which can be achieved high contrast theme trick. To apply the buggy transparency effect you can download Aero8Tuner. It actually force the high contrast to enable the transparency. After downloading Aero8Tuner from the above link, open it. The window will look somewhat like the image given below. Now, after opening the Aero8Tuner check the option which says Force High Contrast Mode. After you tick the Force High Contrast Option you can exit Aero8Tuner. Now you will get a buggy transparency effect on your Windows 8 OS. Now we will remove that bug. Now to remove the bug you will need to download bLend. After downloading the software open it. The Window will look somewhat like the image given below. 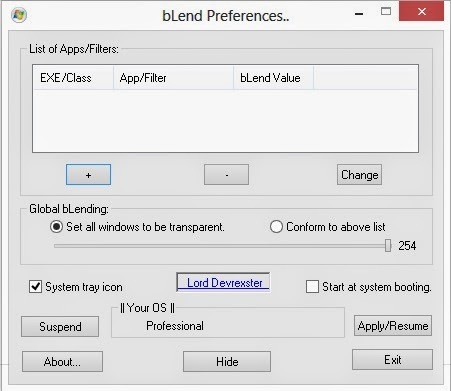 After opening bLend tick/select the option that says Set all windows to be transparent and than move the transparency level to the end i.e., 254. Don't forget to select/tick the option that says Start at system booting. Now you can click on Apply/Resume button. That's it! 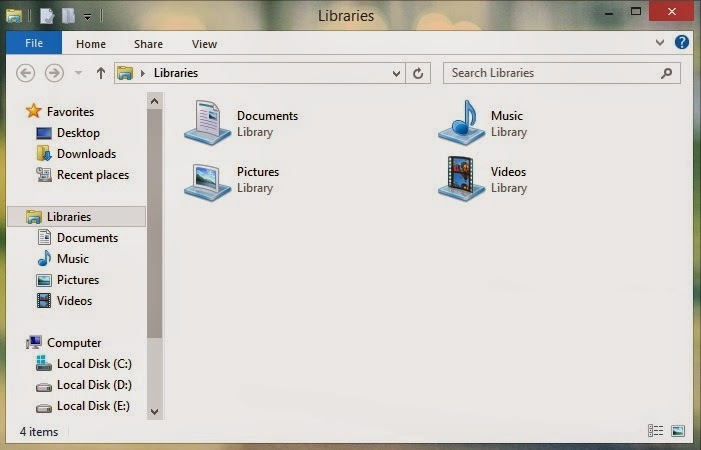 It will make the transparency effect stable and permanent in Windows 8. Take a look at the image of the Aero transparency effect window given below. You can see in the above image that the transparency is working very well without any bug. 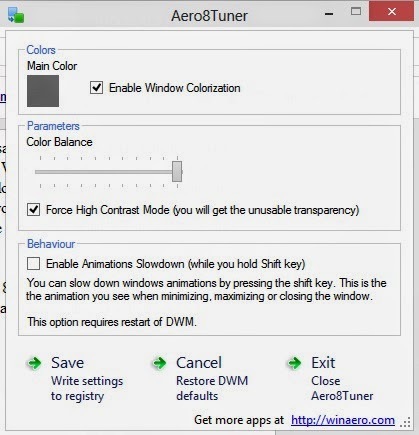 Just follow the above given steps carefully and enable Aero Transparency effect on Windows 8 without any Bug or glitch. Didn't understand the above steps? You can see the video tutorial below and apply the new transparency effect in your Win 8 PC. If you find any difficulty than feel free ask me on comment. That's All! I hope you like this trick.